The Republic of the Congo, also known as Congo-Brazzaville, located in Central Africa, was formerly part of the French colony of Equatorial Africa. After independence in 1960, the former colony of French Congo became the Republic of the Congo. 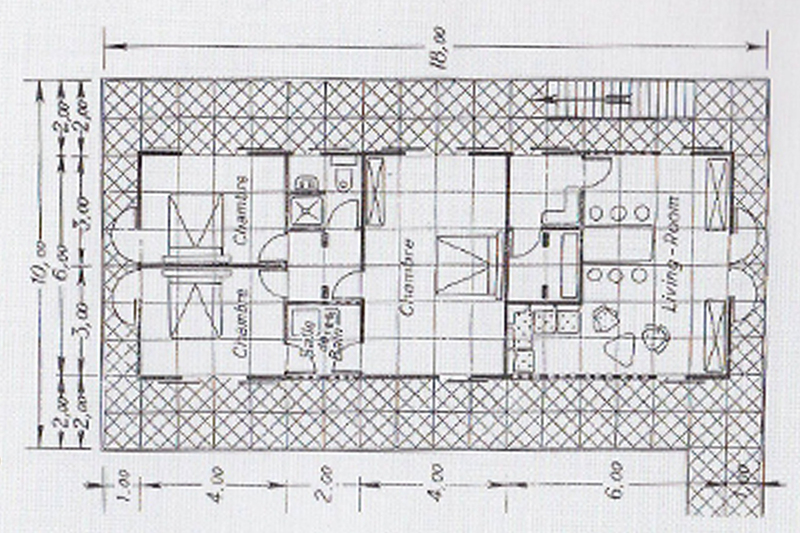 The French modernist Jean Prouvé was commissioned to produce three prototype prefabricated tropical houses as an attempt to address the housing shortage in France’s West African colonies. The three houses, known as Les Maisons Tropicales, are considered the result of twenty years of his fascination and experimentation into the prefabrication and industrial production of buildings. 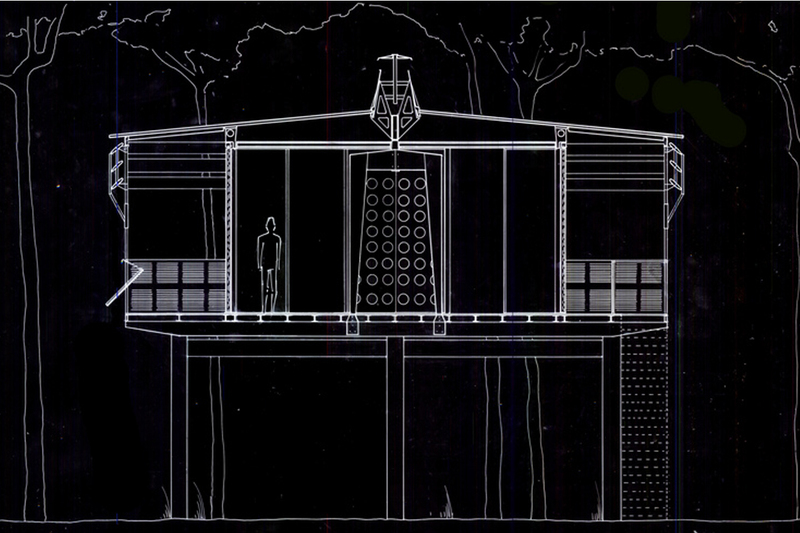 In 1951, two prototype houses were erected in Brazzaville, the capital of the Republic of Congo. The smaller house was an information office for the company Aluminium Français; the larger house was the home of the company’s commercial director, Jacques Piget. Set on concrete stills on a sloping site, La Maison Tropicale consisted of a folded, sheet steel portal frame with fixed and sliding aluminium wall panels. 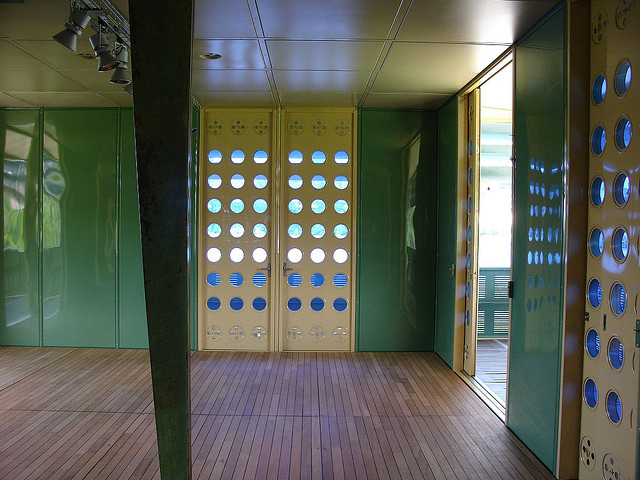 An adjustable aluminium sunscreen surrounded the veranda and acted as an outer reflective skin, as a response to the hot climate. 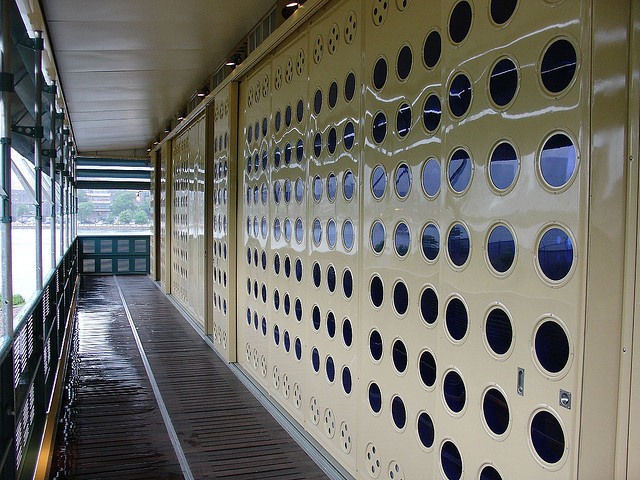 Blue glass portholes protected against UV rays and the double roof structure provided natural ventilation. The components were designed with industrial production and transportability in mind. They were manufactured in France and transported for assembly on site. 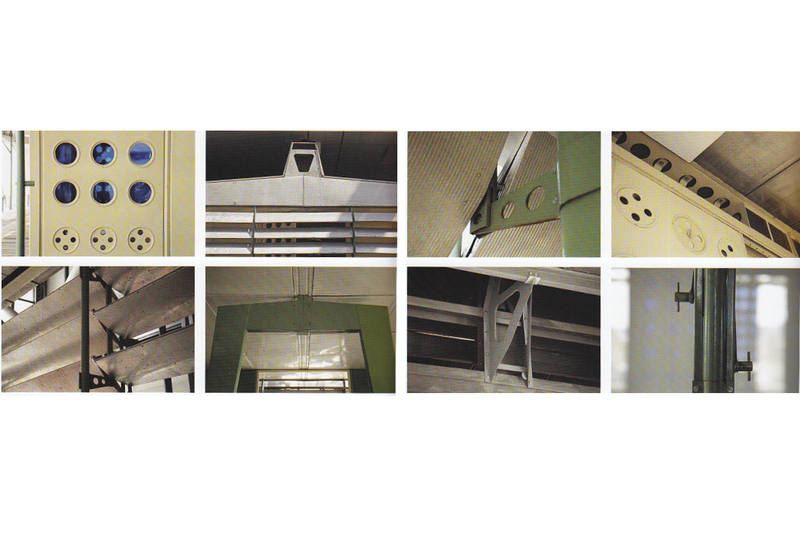 It was important that they be flat in order to be tightly packed into a cargo plane for ease of transport. 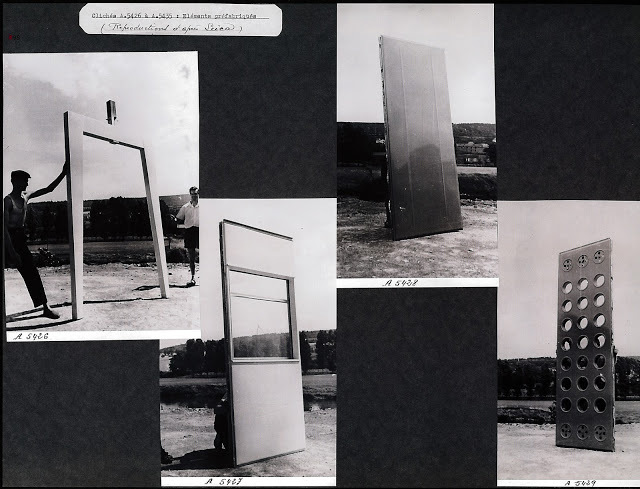 They also needed to be light so that they could be carried by just two men for ease of construction and not wider than 4m, the width of the rolling machine at Prouvé’s factory, for economy of manufacture. Due to its rationality, prefabricated components, standardisation and innovative qualities, the Maison Tropicale became an icon of industrial modernism. 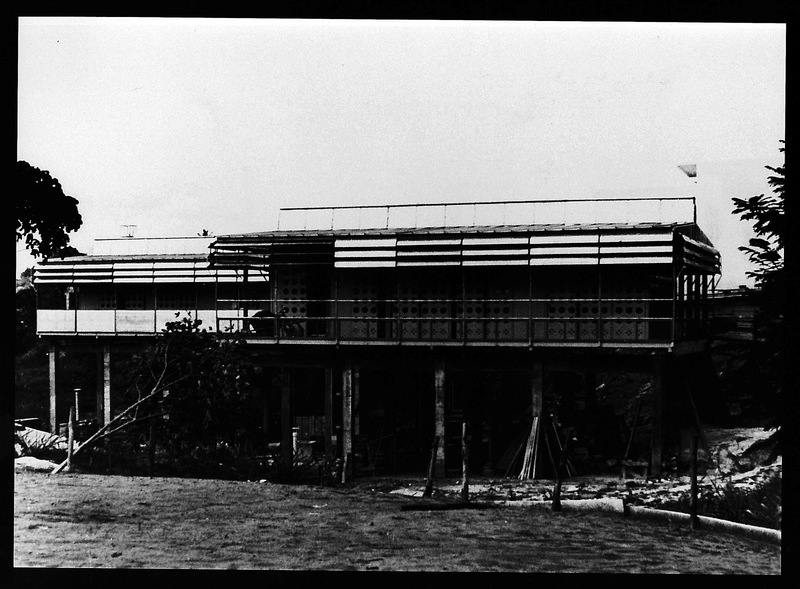 Although designed for mass production, the prototypes proved to be no more economical than local built structures, and their industrial aesthetic did not appeal to the conservative expatriate French community, so no further tropical houses were fabricated. By 2000 the prototype houses were neglected. They were taken apart and returned to France for restoration. Later to be exhibited as modernist masterpieces in New York (2007), Centre Pompidou in Paris (2007) and outside the Tate Modern in London (2008). Simultaneously, this universalist philosophy pointed to the fact that apart from a modernist design, La Maison Tropicale was very much a colonial object. It was assumed that European modern architecture was superior to local building styles and that French prefabricated housing was better suited to the climate than the local vernacular. Instead of using local building materials, the French promoted the use of aluminum, brick and cement. The French state-owned company Aluminum Français extracted raw materials from the West African colonies, which were refined into aluminum in France. 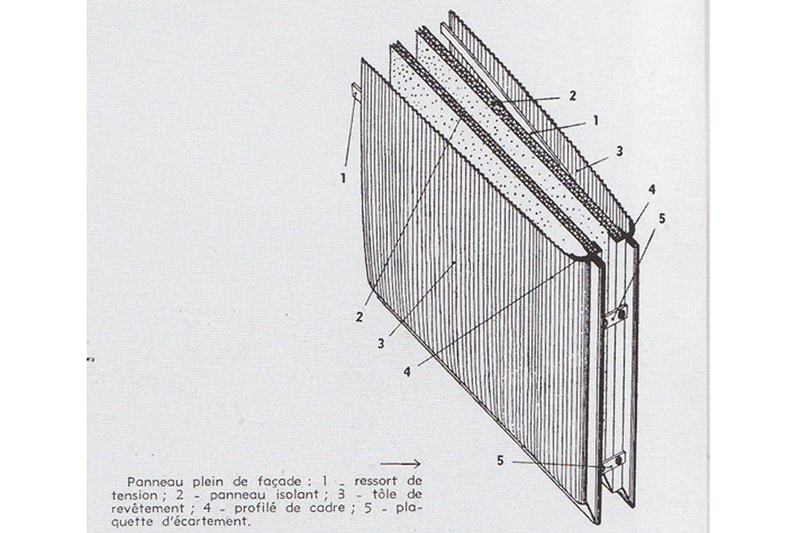 This refined aluminum was subsequently used to construct Prouvé’s Maison Tropciale. Taken from West Africa, this aluminum was returned to West Africa as a different, finished product – a product that showcased the “technical superiority” of the French. The French colonials regarded their modern and innovative architecture as an expression of their superiority over the indigenous people, and therefore used it to exert cultural dominance. The French project failed. 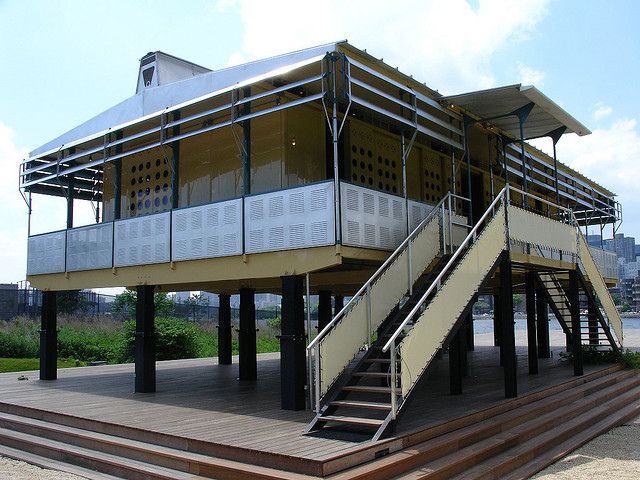 Instead of realizing the fabrication of La Maison Tropicale as a large scale solution as planned, only three prototypes resulted – built and placed in Congo and Niger. The approach adopted in the 1950´s is in stark contrast to some of the work we are seeing in developing countries today, where architects aim to utilise locally sourced materials, local technologies and to empower the local community. Great examples of this more sustainable, more social, architecture can be seen in the works covered here in 196plus on Afghanistan, Bolivia, and Burundi, as well as next weeks post on The Democratic Republic of Congo.